This article is applied to TT520PW, TT521PW, TT522PW, TT6X0W, TT6X0CW, TT7X0PW, TT7X0LPW, TT520G, TT8X0G. 1,Please get into your camera Web setting page here is our link for how to login the web setting page of my camera. 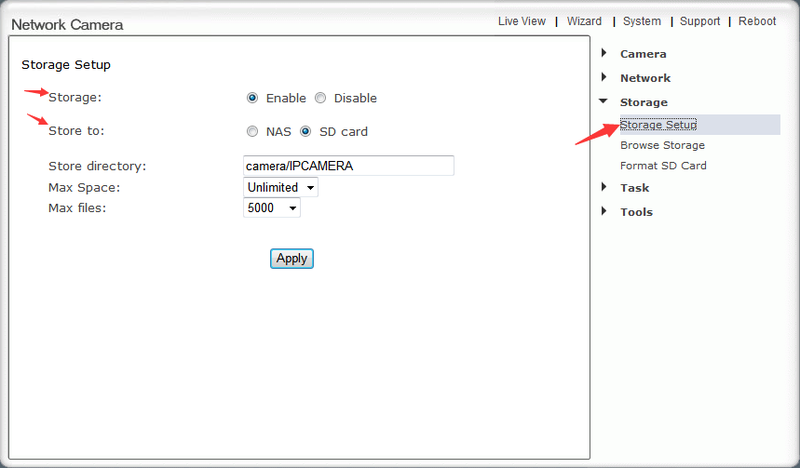 2, Set the camera store to your MicroSD card or NAS Device. In the Web setting page, click on “Storage” and select “Storage Setup”, on the storage setup page, enable storage, and select SD card or NAS as your camera storage. 3,Set your titathink camera continuously record the video stream to your SD card or NAS device. 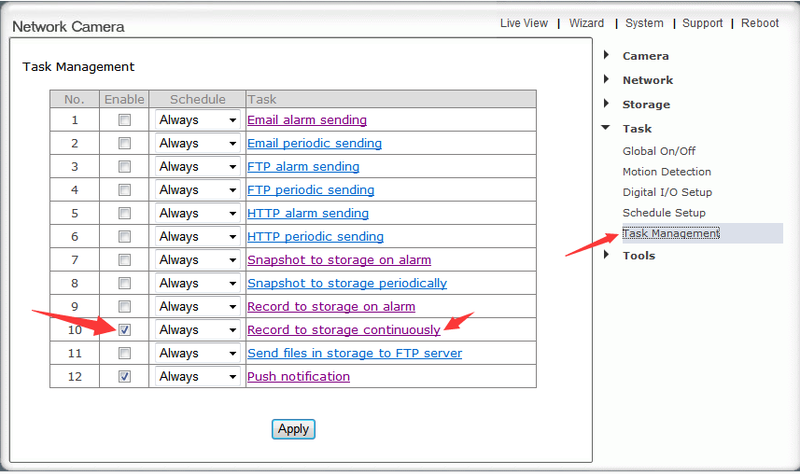 On the Web setting setup page, Click on “Task” and select “Task Management”, in the Task Management page, enable “ Record to storage continuously ”, then click “Apply”, then the camera will record to your storage(NAS or MicroSD card) continuously. You can also setup its parameters by clicking on it. Home/ Article/How to set your titathink camera continuously record the video streaming to your storage(NAS or MicroSD card).